Welcome to Presque Isle Lodge! Built in 1920 by Newell Avery Eddy Jr., the Presque Isle Lodge is a National Registered historical landmark. The Lodge is located midway between Alpena and Rogers City on Michigan’s “Sunrise Side”. Nestled in a scenic wooded setting and across from gorgeous Grand Lake, The Lodge offers an unrivaled experience in relaxation and enjoyment. Since 1986, the Spencer family has owned and operated the Presque Isle Lodge. Your relaxation and enjoyment are our highest priority. It will be our pleasure to share with you all of the many delightful aspects of the Presque Isle Community which includes six historical landmarks. The Lodge is open seasonally May through September. We do have “High-Speed Internet” ! Hand-hewn from pine logs prior to the advent of electricity, the over 10,000 square foot Presque Isle Lodge with its large stone fireplace is a perfect setting for your wedding. Your hosts the Spencer’s can help you arrange all aspects of your special day, from flowers to food to personal touches for your guests. 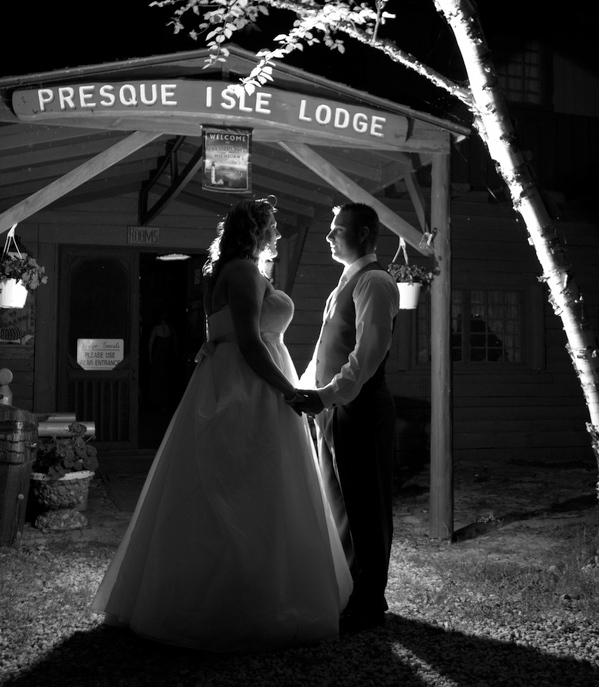 Whether you hold your ceremony in front of the fireplace surrounded by family and friends, outdoors on the hill near Grand Lake, or in a wooded setting with serene Lotus Pond as a background, the Presque Isle Lodge will provide an intimate, unforgettable setting for your wedding celebrations!